Risk Management Colleagues Polly and Kevin on Asian Pacific American Heritage Month. Meet Polly and Kevin. They joined Citizens Bank right after graduation as part of our Risk Management Development Program (RMDP). The RMDP is a two-year training program that helps colleagues gain expertise in credit, enterprise, compliance and operational risk, and model risk management. 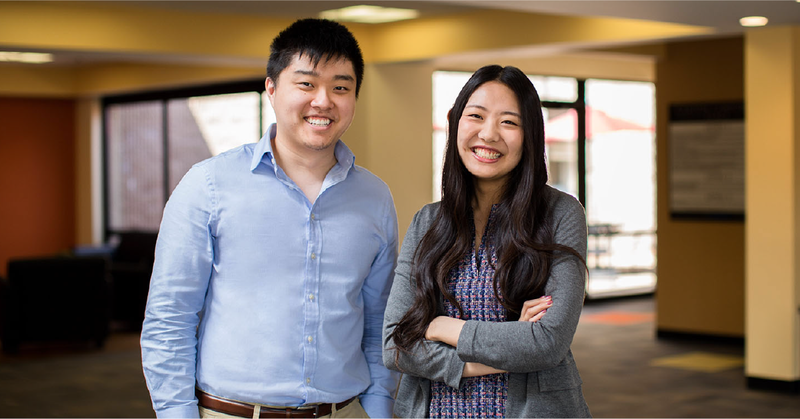 We sat down with Polly and Kevin to talk about their roles and their thoughts on Asian Pacific American Heritage Month (APAHM). In the month of May, we celebrate the traditions, culture and history of Asian Americans and Pacific Islanders in the United States. When did you join Citizens and what is your current role? In what way do you serve our customers? Kevin: I joined in June 2017 as a Risk Management Associate. I work in Enterprise Risk Management and assist in Material Risk Identification (MRI). My team helps the bank identify and access new, existing, and emerging residual risks. We then develop or redefine the practices that surround them through a rigorous review, challenge, and approval governance process. Polly: I joined in June 2016 and I am currently in Consumer Credit Risk. Specifically, I work behind the scenes with credit cards, helping to manage credit limits, assess customer ability to pay back credit and improve the credit card experience for our customers. In Asian Pacific American Heritage Month (APAHM), we recognize the accomplishments of Asian Americans and Pacific Islanders and acknowledge the generations of folks who make up America today. What does the month mean to you? Polly: Growing up, I never really celebrated the month as I was raised in a predominantly non-Asian community. However, I value how the month symbolizes an appreciation for and inclusion of Asian Americans and Pacific Islanders within the American narrative. There are many unique elements embodied in the culture and history of these various ethnicities, and this month helps to bring awareness and a voice to a minority group which is oftentimes soft-spoken. Is there anything you want to share about your heritage that you are proud of or would like people to understand? Polly: I am really proud of my parents’ immigrant story. They moved from China when they were a bit older than I am now, starting their lives over to give me a life in America. The fact that they were able to do so is incredibly brave, especially considering the limited resources they had at their disposal. They have taught me countless lessons, but two that still resonate and remain with me today are adaptability and emotional intelligence. Kevin: My parents had a similar story. They emigrated from China, were accepted into universities, and worked very hard to create stable and successful lives for themselves. I am particularly appreciative of the opportunity they provided me. As a kid, my parents signed me up for all sorts of activities and let me really choose where I wanted to direct my interests and passions. Kevin: I am a pretty simple man. I like to play videogames, work out at the gym and hang out with my girlfriend on the weekends. A little known fact about me is that I was a professional pool player when I was 12. I’ve since retired but I still have it if anyone wants to challenge me! Polly: I watch a lot of crime dramas—Elementary is one of my favorites at the moment! It’s a Sherlock spin-off that features an Asian American actress as Watson. I also volunteer for the Boston Asian American Film Festival. It’s a non-profit organization devoted to empowering Asian Americans through film by showcasing their experiences and serving as a platform to filmmakers and the Greater Boston community. This year we are celebrating 10 years! Want to hear more from our exceptional colleagues? Click below for more stories like this one!